BALTIMORE, March 27, 2018 /PRNewswire-USNewswire/ -- For the first time, the rising number of women in urology surpassed 20 percent of all practicing urologists under the age of 45. 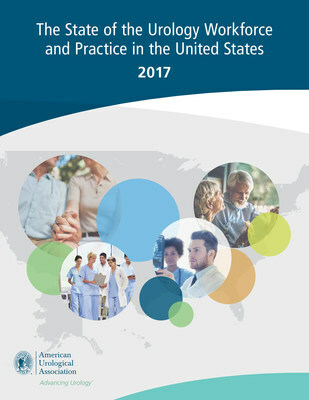 This new data, as well as further findings regarding the growing number of female urologists actively practicing in the United States, are highlighted in the American Urological Association's (AUA) newly released 2017 Annual Census report, The State of the Urology Workforce and Practice in the United States. Committed to providing a definitive basis of data regarding the urologic community, the AUA launched its first Annual Census in 2014. It not only defined and estimated the practicing urologist population, but for the first time in the history of urology, reported the workforce and practice characteristics of the entire population of practicing urologists. Today, the Census remains a novel data source that explores the urologic profession and reports both cross-sectional variations and trends. Results from the survey provide an array of information aimed at bridging knowledge gaps, meeting increased research needs and ultimately, improving patient care. The 2017 U.S. urologist population consists of a total of 12,517 practicing urologists. The percentage of female urologists grew in 2017 to 8.8 percent of the U.S. urologist population, up from 8.5 percent in 2016. The percent of practicing urologists over the age of 55 increased to 52 percent in 2017 vs. 50.6 percent in 2016. Practicing urologists continued to see an average of 70 patients per week or 3,360 patients per year. Approximately 60 percent of practicing urologists in the United States work in private practice; while 39.5 percent practice in institutional settings such as hospitals or academic medical centers. Of the group in private practice, nearly 34 percent belong to single urology specialty groups and 16 percent belong to multispecialty groups. Adopting electronic health records (EHRs) and fulfilling CMS mandates are the top issues causing job dissatisfaction among urologists. "The AUA U.S. Census data continue to demonstrate an evolving urologic workforce with increasing percentages of female practicing urologists, practicing urologists over the age of 55 and urologists who maintain their primary practice outside of metropolitan areas, said Steven M. Schlossberg, MD, chair of the AUA Data Committee. "As the AUA Annual Census enters its fifth year, it will continue to serve as a tool for researchers and a resource about the realities of practicing urology for health policy leaders."